We disembarked from the Disney Wonder and exhaled happy, contented sighs. Yes, we snuck away for a mid-winter break and barely told a soul - it was to be a no-work trip! But we had such a great time that we wanted to share the highlights of our cruise with you, along with tips on making such magic happen on your cruise, too! Enjoy! "Dave Marx, you're a million point winner!" Those words, accompanied by thunderous applause, were the start of our cruise adventure. 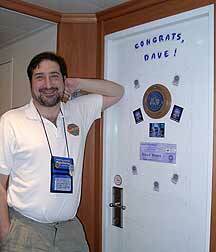 On May 21, 2002, Dave became the 32nd million-point winner at "Who Wants To Be A Millionaire--Play It!" at Disney-MGM Studios (see our separate trip report for the details). Originally the grand prize was a trip for two to New York City to see a taping of the network show. But when the show format changed this past fall, Disney decided to also change their prize to a 3-night Disney Cruise. We were informed of the change in the fall, much to our delight. Dave received his free cruise voucher in the mail in December. After the New Year, when we had a fairly good idea of when we'd have time to slip away for a weekend, we faxed in our request to sail on January 23! A few days later we received confirmation that space was available on that cruise (which also happened to be the Annual Passholder Cruise). The package Dave won was all-inclusive -- Disney paid for the cruise fare, the flights, and the gratuities. Whatta deal! Note: Alas, "Who Wants To Be A Millionaire--Play It!" at Disney-MGM Studios closed in 2006. If you're interested in reading more about it from a historical perspective, see our April 2001 Trip Report. Our flight was at 7:30 am on Thursday morning, so we packed our bags the night before and set the alarm for 4:00 am. We both had some problems getting to sleep -- we often go to sleep at 4:00 am. We eventually fell asleep after midnight. I woke up during what I thought was the "middle of the night" and happened to glance at the clock. 5:38? Oh no! The alarm hadn't gone off and we'd overslept. We leaped out of bed and raced to get going. I took a 3-minute shower while Dave dressed and took the bags to the car. We hurried Kippi (our dog) into the back seat, and off we went! It took us only 15 minutes from warm bed to freezing car. We went through a quick checklist to make sure we had everything crucial with us while we dropped off Kippi at a friend's house for the weekend. Then we were off the airport. We breathed a sigh of relief when we realized that we were going to make it in time. TIP: Double-check -- no, triple-check -- that your alarm is properly set. And then set a backup alarm on your watch or in your handheld organizer. You may also want to ask a friend or family member to give you a call, if you aren't getting up too early. Thanks to the fact that our package included air, this would be our first time flying through "Disney Air" and we were looking forward to learning more about how it works. About a week after our cruise was booked, a Disney representative called us to inform us of our flight schedule. It turns out we were going to fly U.S. Air, which is unusual for Detroit to Orlando. And, sure enough, it wasn't a direct flight -- we had a stopover in Pittsburgh. Yuck. We asked if we couldn't get a direct flight, and they said they would have booked us a direct flight but they were no longer available for our travel dates. And when we called the airline to check on our seat assignments, we discovered that we were not sitting next to each other for two of the hops. Ouch! So while we're certainly not going to complain -- after all, this was a free cruise -- we also were not terribly impressed with Disney's arrangement of our air travel so far. At the airport, however, check-in went smoothly. We boarded a little "puddle-jumper" plane for our first leg to Pittsburgh. After taxiing to the runway, the plane had to go back to the terminal for de-icing. So we arrived in Pittsburgh 30 minutes late... and we had only 30 minutes to board our plane to Orlando. We speed-walked through the Pittsburgh terminal and just made it onto the plane. After an uneventful flight to Orlando, we arrived on time and in good spirits. We found the Disney Cruise Line representatives in the main terminal (just past the security checkpoint). We checked in with the reps and then we were escorted down to level 1, where we boarded a DCL motor coach. We didn't have to bother with our luggage -- DCL's luggage tags meant our bags went from the airport to the ship without our intervention. And, sure enough, the luggage arrived in our room around 3:30 pm without a hitch. The return trip was equally seamless. We checked in for our flight at the cruise terminal (near the motor coaches), handed over our bags, and they were waiting for us when we arrived in Detroit. TIP: If possible, arrange your air travel on your own -- it's often less expensive and you have more control over flights. If you must use a connecting flight, try to get a layover of at least 90 minutes just in case your first flight runs late. Better yet, arrange to fly in the night before your cruise leaves. During check-in at the cruise terminal, a cast member noticed our PassHolder pouches and asked about PassPorter. We mentioned that we we'd just finished writing a guidebook to the Disney Cruise Line and she got very excited. We showed her the book, and she brought her manager over to look at it as well (we'd brought a "dummy" version with us to have on the cruise -- it was a photocopied version made at Kinko's). After making a fuss over the book, she told us she'd tried to get us a stateroom upgrade, but the ship was completely fully and there was nowhere to move us. That was a nice thought, though! Dave and I agreed this trip should be completely R&R. But I decided to throw a couple of more R's in there -- reward and recognition of Dave. So before the cruise, I scanned some of the things Dave received when he won Millionaire, such as his million-point pin and his fake boarding pass. I also found the Millionaire logo and a photo I'd taken of Dave in the hot seat. I printed these out onto sheets of inkjet magnet paper (available at office supply stores) and cut out each image. I also printed out letters to spell "Congrats, Dave!" I hid the magnets in our carry-on so I'd have easy access to them once aboard. I did two other sneaky things before we departed. One was to purchase a metallic tinsel banner that read "Congratulations!" Upon this I taped printed mages of the Millionaire logo and Dave's million-point pin. The other surprise was ordering a gift from Disney, which would be waiting for him when he arrived. When we got into our stateroom, a huge box was perched on the bed. Dave immediately investigated and discovered the message "Congratulations on being a million-point winner! Love, Jennifer" The box was mostly filled with packing material, but among it was a watch, pair of binoculars, water bottle, and straw beach mat -- all with the Disney Cruise Line logo. While Dave was playing with his new toys, I excused myself and stepped outside our stateroom with my magnets. I arranged them on the outside of our stateroom door. They looked great, and plenty of people remarked on them while I was putting them up. Dave didn't notice the magnets until later, when he left the room. He was very pleased, and I took his photo in front of the door for posterity. The banner I put up a little later, while Dave was distracted. All in all, he was happy and it worked out well! Dave doesn't really strike me as a Bingo person, but he was enthusiastic about trying a game. So on our first day we arranged to meet in WaveBands for the first bingo game of the cruise. I met up with him during the first game -- he had bought a value pack (five three-card games for $20). You can also get a single pack (five one-card games) for $10 each. There were perhaps 100 other people playing, so with only five games to win, the chances weren't great. Nevertheless, on the third game Dave did win... $99 to be exact. We were astounded and happy. TIP: Give Bingo a try. The odds of winning are better earlier in your cruise (when there are fewer people playing) and when you purchase a value pack. Kids can attend and help their grown-ups play, but they can't collect winnings. Breaking with tradition, Dave and I danced during 70s Night at WaveBands on the first night of the cruise. After a few songs, the crew announced that anyone who'd been given key chains should come up to the stage. Unbeknownst to me, Dave had received a key chain so he dutifully trudged up to the stage. He and four other guys were ushered out of the room. (Dave adds: We spent that time rehearsing, and we each got a free shot of booze to boost our courage.) While they were gone, other lucky participants were drafted into lip-synching and dancing contests. Once those were finished, the crew announced that we had special guests... and in strutted five men -- all without shirts and decked out like The Village People. Dave was among them, wearing nothing more than a police cap (well, he had pants and shoes on too). He did a great job of dancing and lip-synching to "YMCA," and I thoroughly enjoyed the show! Alas, I have no pictures of it, but as Dave says, some images are better as memories. TIP: Get out and dance at the start of the 70s and 80s Nights on the cruises. You (or your spouse/family member/friend) may get picked to perform -- and maybe even get a free shot. These events make great memories! Can you even believe it? On our second day, Dave played Bingo again, while I observed. And on his second game, he won again. How much this time? $107! I couldn't believe his luck! TIP: Don't listen to pessimists like me when they say, "you've already won once, you won't win again." You can't win if you don't play! One of the first things I did once I was aboard was purchase a 3-day pass for the Tropical Rainforest in the Vista Spa. The pass cost $30 and allowed me unlimited use of the Tropical Rainforest during the cruise. The Tropical Rainforest has two steams rooms, one large sauna room, two aromatic showers, and heated tile loungers. I've visited the Tropical Rainforest on virtually every past cruise and absolutely love it. This is the first time I'd gotten a pass for the length of the cruise, though. I first used it right after the Sailaway Party, and then four times over the following two days. I visited the spa in the morning before breakfast (it opens at 8 am) so I could start the day out right and take a long, leisurely shower. While there are two aromatic showers and one regular shower in the Tropical Rainforest room, I preferred the regular showers in the locker rooms. They have excellent water pressure, luxurious 9" wide shower heads, and a handy dispenser of soap, shampoo, and conditioner. And the sleeping part? More than once I fell into a light doze while relaxing on one of the heated, tiled recliners in the Tropical Rainforest. Ahhhhhh. TIPS: Try out the Tropical Rainforest for a day ($15), and if you like it, get the cruise-long pass at $10/day (if it makes sense money-wise). You can also use the Tropical Rainforest for an extra $7 with most spa treatments. All cruisers can use the locker rooms and regular showers at no charge (great if there's a line for your stateroom shower). Just ask for a locker basket at the reception desk! You've probably already guessed -- Dave won at Bingo again! That's three for three. He didn't win the snowball jackpot, but he did rake in another $108 bucks, for a total of $314 for the three games. I guess this really was a one in a million cruise! DAVE'S COMMENTS -- While Disney didn't do anything during the cruise to recognize my acheivement at Millionaire, Jennifer did a wonderful job of turning my prize into a special event. (Thanks, sweetheart!) No matter what the occasion, don't forget that you can make your own magic! We had the dubious pleasure of cruising on a weekend of record-breaking cold weather. We went from near-zero temperatures in Michigan to a windswept, chilly cruise, with daytime highs in the mid-50s. My hat's off to Jennifer, who bravely walked with me along Nassau's blustery waterfront while I visited some out-of-the-way sights.